Squash Pie. Yep. I said it. At first I was really hesitant, but then I figured that we eat pumpkin pie and sweet potato pie, and both of those are pretty good. So why not try a squash pie? I had a TON of yellow squash because for a few weeks at the end of the summer, we were getting them every week in our CSA. I used them in quiches and burritos and enchiladas and still had some leftover. So in addition to taking a vegetable quiche to my grandma’s over Labor Day weekend, I decided to take a pie. This came out pretty good. It is super thin — more like a tart than a pie. Also, I made it in a tart pan, so there’s that. The flavors are pretty subtle. There’s not a ton of sugar, and squash has a mild flavor, so the almond really takes over here. I think it would be cool to try it again with vanilla extract instead of almond and see how that goes. Overall, it was good. Not necessarily my favorite, but also I prefer my desserts to be overloaded with sugar and chocolate. But if you’re looking for a more subtle flavor, this may be it. Have you ever had a squash pie? What do you think of it? Mix together flour, oil, milk, sugar, and salt. Blend evenly. Spread mixture into a 9″ pie pan or tart pan, pushing dough evenly across the bottom and up the sides. Transfer the squash to a blender. Add the butter and flour, and blend until pureed. Add the sugar, almond extract, and egg; blend until smooth. Pour the filling into the pie crust. Bake until the filling is set, 45 minutes to 1 hour. Let the pie cool to room temperature before slicing and serving. 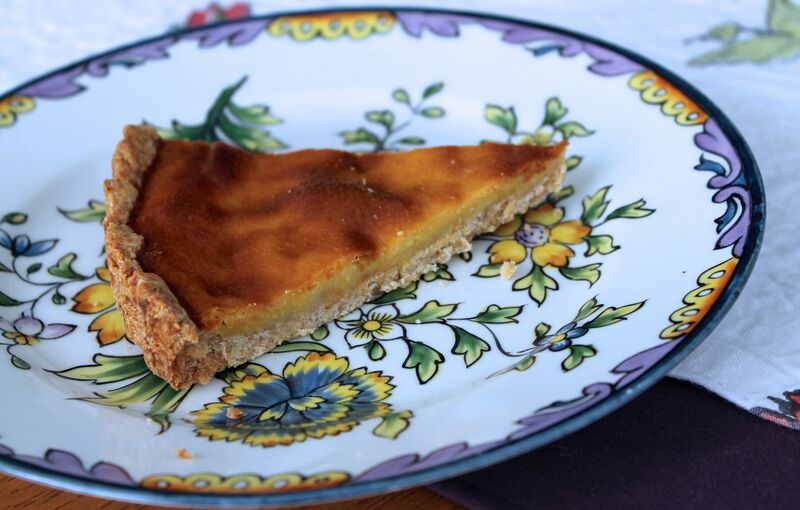 This is a fabulous Squash Pie, I can’t wait to try this recipe. Thank you so much for sharing with Full Plate Thursday and have a fun weekend! Of course, I’m happy to share with your link-up! Thanks so much for visiting. If you try the recipe, let me know how you like it!